For ither uises, see Chornobyl (disambiguation). A grocery store in Chornobyl. The text on the windae reads, "Café Bar". Chornobyl or Chernobyl (IPA /tʃɜː(ɹ)ˈnɒb.əl/; Ukrainian: Чорнобиль, pronounced [tʃɔrˈnɔbɪlʲ]; Roushie: Чернобыль, pronounced [tɕɪrˈnobɨlʲ]) is a ceety in the restrictit Chornobyl Exclusion Zone situatit in northren Kiev Oblast, Ukraine near the mairch wi Belaroushie. The ceety haed been the admeenistrative centre o the Chornobyl Raion syne 1932. The ceety wis evacuatit in 1986 due tae the Chornobyl disaster at the Chornobyl Nuclear Pouer Plant, locatit 14.5 kilometres (9.0 mi) north-northwast. The pouer plant wis athin Chornobyl Raion (Destrict), but the ceety wis no the residence o the pouer plant wirkers. When the pouer plant wis unner construction, Pripyat, a ceety lairger an closer tae the pouer plant, haed been biggit as hame for the pouer plant wirkers. Efter the accident the Chornobyl Raion admeenistration wis transferred tae the neebourin Ivankiv Raion. Tho the ceety the day is maistly uninhabitit, a smaw nummer o fowk reside in hooses markit wi signs statin that the "Awner o this hoose lives here". Wirkers on watch an admeenistrative personnel o the Zone o Alienation are stationed in the ceety on a lang term basis. Prior tae its evacuation, the ceety wis inhabitit bi aboot 14,000 residents. The ceety o Slavutych wis biggit specifically for the evacuatit population o Chornobyl. The ceety name is the same as a local Ukrainian name for Artemisia vulgaris (mugwirt or common wormwood), which is чорнобиль "chornobyl" an aw. A alternative etymologie haulds that it is a combination o the wirds chornyi (чорний, black) an byllia (билля, gress blades or stalks), hence it wad leeterally mean black gress or black stalks. Oreeginally pairt o the laund o Kievan Rus Chornobyl first appeared in a chairter o 1193, describit as a huntin-lodge o Knyaz Rostislavich. It wis a croun veelage o the Grand Duchy o Lithuanie in the 13t century. The veelage wis grantit as a fiefdom tae Filon Kmita, a caiptain o the ryal cavalry, in 1566. The province conteenin Chornobyl wis transferred tae the Kinrick o Poland in 1569, an then annexed bi the Roushie Empire in 1793. Prior tae the 20t century, Chornobyl wis inhabitit bi Ukrainian an some Pols peasants, an a relatively lairge nummer o Jews. Chornobyl haed a rich releegious history. The Jews wur brocht bi Filon Kmita, durin the Pols campaign o colonization. The tradeetionally Christian Eastren Orthodox Ukrainian peasantry o the destrict wis lairgely forcit, bi Poland, tae convert tae the Greek Catholic Uniate releegion efter 1596. Yet the vast majority returned tae Eastren Orthodoxy efter the Pairtitions o Poland. The Dominican kirk an monastery wur foondit in 1626 bi Lukasz Sapieha, at the hicht o the Coonter-reformation. Thare wis a group o Auld Catholics, who opposed the decrees o the Cooncil o Trent. The Dominican monastery wis sequestratit in 1832, follaein the failed Pols November Uprisin, an the kirk o the Auld Catholics wis disbandit in 1852. In the seicont hauf o the 18t century, Chornobyl became ane o the major centres o Hasidic Judaism. The Chornobyl Hasidic dynasty haed been foondit bi Rabbi Menachem Nachum Twersky. The Jewish population suffered greatly frae pogroms in October 1905 an in Mairch–Apryle 1919, when mony Jews wur killed an ithers wur robbit, at the instigation o the Roushie naitionalist Black Hunders. In 1920, the Twersky dynasty left Chornobyl, an it ceased tae exist as a Hasidic centre. Syne the 1880s, Chornobyl haes seen mony chynges o fortune. In 1898 Chornobyl haed a population o 10,800, includin 7,200 Jews. In Warld War I the veelage wis occupee'd, an in the ensuin Ceevil War, Chornobyl wis focht ower bi Bolsheviks an Ukrainians. In the Pols-Soviet War o 1919–20, it wis taken first bi the Pols Airmy an then bi cavalry o the Red Airmy. Frae 1921, it wis incorporatit intae the Ukrainian SSR. Durin the period 1929–33, Chornobyl suffered greatly frae mass killins durin Stalin's collectivization campaign, an in the Holodomor (faimin) that follaeed. The Pols commonty o Chornobyl wis deportit tae Kazakhstan in 1936 durin the Frontier Clearances. The Jewish commonty wis murthert durin the German occupation o 1941–44. Twinty years later, the aurie wis chosen as the steid o the first nuclear pouer station on Ukrainian soil. The Duga-3 over-the-horizon radar array several miles oot o Chornobyl wis the oreegin o the infamous Roushie Woodpecker, designed as pairt o Roushie's anti-ballistic missile early warning radar network. Wi the dissolution o the Soviet Union in 1991, Chornobyl remained pairt o Ukraine, nou a unthirlt naition. On 26 Apryle 1986, Reactor #4 at the Chornobyl Nuclear Pouer Plant near the toun o Pripyat, Ukraine, explodit. The explosion teuk place at 1:23am while the neebourin toun o Pripyat slept. Twa wirkers wur killed instantly. 40 oors later, the residents o Pripyat wur ordered tae evacuate, an maist niver returned; bi that time, mony o the residents haed suffered varyin degrees o radiation pushionin. In 2003, the Unitit Naitions Development Programme launched a project cried the Chornobyl Recovery an Development Programme (CRDP) for the recovery o the affectit auries. The program launched its activities based on the Human Consequences o the Chornobyl Nuclear Accident report recommendations an wis initiatit in Februar 2002. The main goal o the CRDP's activities is supportin the Govrenment o Ukraine tae mitigate lang-term social, economic an ecological consequences o the Chornobyl catastrophe, amang ithers. 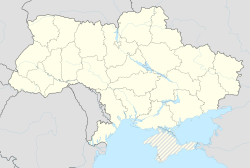 CRDP wirks in the fower maist Chornobyl-affectit auries in Ukraine: Kiev Oblast, Zhytomyrska Oblast, pairtially Kiev, Chernihivska Oblast an Rivne Oblast. Chornobyl wis evacuatit suin efter the disaster. The base o operations for the admeenistration an monitorin o the Chornobyl Exclusion Zone wis muivit frae Pripyat tae Chornobyl. Chornobyl currently conteens offices for the State Agency o Ukraine on the Exclusion Zone Management an accommodation for visitors. Apairtment blocks hae been re-purposed as accommodation for employees o the State Agency. Due tae regulations tae leemit exposur wirkers in the Chornobyl Exclusion Zone are limitit in the nummer o days per week or weeks per month thay stay in Chornobyl. Chornobylite is the name citit bi twa media soorces for heichlie radioactive, unuisual an potentially novel crystalline formations foond at the Chornobyl pouer plant efter the explosion. Thir formations wur foond in the basement belaw Reactor #4 durin a investigation intae missin reactor fuel. ↑ Chornobyl ancient history and maps. ↑ Davies, Norman (1995) "Chornobyl", The Sarmatian Review, vol. 15, No. 1. ↑ BBC Special Report: 1997: Containing Chornobyl? United Nations Chernobyl Recovery and Development Programme See the actions o the Chernobyl Recovery an Development Programme towards Chernobyl-affectit aurie an its population.